Widescreen monitors are great for watching movies and organizing windows side-by-side, but a lot of time the space goes to waste. Consequently, I'm going to suggest a radical idea, one that's particuarly applicable to laptop and netbook users: Move the Windows Taskbar to the side of the screen. If you've been a Windows user as long as I have, I promise you'll hate this--at first. But think about it: Web pages, Word documents, and the like run top-to-bottom, so the more vertical space you can give them, the better. By relocating the Taskbar to the left side of the screen (or the right, if you prefer), you're freeing up vertical space for stuff you use every day while making smarter use of wasted horizontal space. 1. Right-click an empty area of the Taskbar and clear the checkmark next to Lock the Taskbar. 2. Left-click and hold an empty area of the Taskbar, then drag it to the left side of the screen. Once you get close, you'll see it lock in, at which point you can release the mouse button. That's all there is to it! Vista users may want to extend the width of the Taskbar to better see the labels for programs that are running. 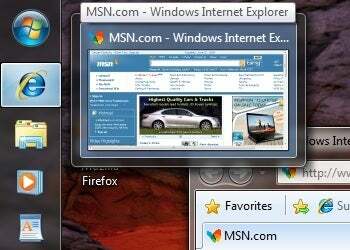 But Windows 7 can keep the Taskbar its naturally narrow self, as that OS doesn't have running-program labels anyway. I'll be waiting here for you to thank me.